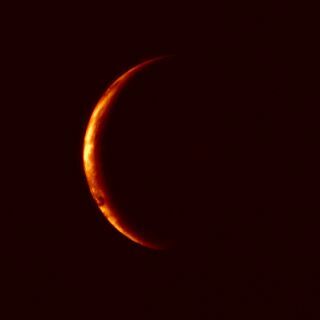 The Earth appears as a bright orange crescent in this infrared view taken by Japan's Akatsuki spacecraft on May 21, 2010 as it headed to Venus shortly after launch. A Japanese spacecraft on its way to study the atmosphere of Venus is set to arrive at the planet today. The Akatsuki probe (Japanese for "Dawn") has been traveling for six months, and is due to reach its destination Monday (Dec. 6) at about 6:50 p.m. EST (2350 GMT), which is early Tuesday morning Japan Standard Time. The craft was launch by the Japan Aerospace Exploration Agency (JAXA) in May 2010. If you know Japanese, you call follow the mission via JAXA's dedicated Twitter feed here. English readers can read updates here.